(Lowell, MA) As a father of an adopted child, I often wonder how I will guide my son through the emotional stages of thinking about his origin story. I picture many long, earnest, possibly tear-filled conversations that will be good for us to go through, but certainly not entertaining. 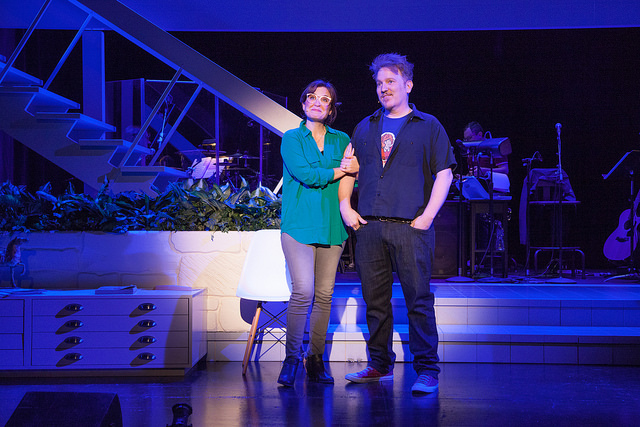 In Little Orphan Danny, wiseass rock singer Dan Finnerty decided to tell his own story of adoption, and it’s indeed a tearjerker of a musical. My eyes were wet and my ribs were sore from laughing so hard. In a fast-paced 90 minutes of theater, Finnerty chronicles what it was like to grow up an awkward, hyperactive, heavyset, adoptive child in the state of New York, as well as how as an adult he found his birth mother and successfully melded her into his family. While the story can sometimes seem scattershot, as Finnerty includes some unconnected stories about his childhood, it never ceases to be entertaining. This is because Finnerty is a masterful storyteller and he somehow manages to own the stage while seeming completely vulnerable in front of the audience. He ad-libs with ease with the audience, and doesn’t miss a beat when a prop files off stage and he has to ask for it back from an audience member. Adding to the vulnerability of the night was the fact that his rockstar voice, which gained him fame as a bizarre wedding singer in two movies, was clearly in distress during the performance I attended, and he clearly had to coax it through the performance. Oh, and his adopted mother was in the audience, so there was that. Finnerty is helped, as are all good frontmen, by a strong backing band – a special nod should go to supporting castmember Julie Foldesi, who is tasked with playing all the women in Finnerty’s life – his birth mother, his adoptive mother, and his wife. Foldesi’s performance is perfectly understated to match Finnerty’s intensity, yet it rings true with every role change. I am not a repeat theatergoer by nature – once I’ve seen a production once, I’m ready to move on, but I can only hope Little Orphan Danny will come back around, and I will be there to watch Finnerty’s chaotic life unfold once more. If it’s a few years from now, I might even take my son. This entry was posted in Comedy and tagged 2018, April, Craig Idlebrook, Dan Finnerty, Dan Lipton, Julie Foldesi, Little Orphan Danny, Lowell, MA, March, Merrimack Repertory Theatre, New York, Sean Daniels by craigidlebrook. Bookmark the permalink.